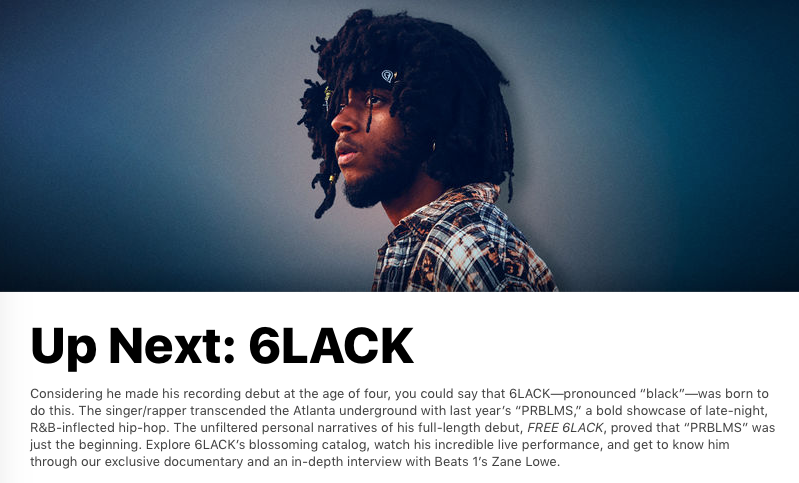 Apple Music has launched a new program called Up Next, which aims to “identify, showcase and elevate developing artists to a global audience,” explains the company. The Apple Music editorial team will choose a new artist each month to promote, which will include a short documentary film, an audio EP from a live session, plus an interview on Beats 1. Artists will also get the chance to be featured on The Late Late Show With James Corden (Apple owns rights to Corden’s Carpool Karaoke). When asked about the future possibility of collaborating with Canada’s The Weeknd, who has influenced him, 6lack said “definitely” and “of course”. You can check out Apple Music’s Up Next here.